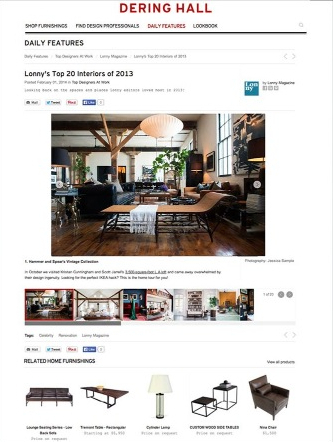 NEW YORK--(BUSINESS WIRE)--Dering Hall, the leading website where sophisticated consumers, interior designers, and architects go to shop and get inspired, today announced a new editorial platform with 40 high-end home design, décor, and architecture publications participating, including Lonny Magazine, Traditional Home, Cottages & Gardens, ELLE DECOR, LUXE Interiors + Design, Design Milk, and Cool Hunting. Every article on Dering Hall now features a selection of related furnishings available from Dering Hall member brands and artisans that allows readers to shop the spirit of the story. The new editorial platform allows print publications, bloggers, and tastemakers to extend their content and brands to Dering Hall's audience of top interior design and architectural firms, and sophisticated consumers. Editorial partners receive a dedicated profile page on Dering Hall that features a selection of their articles, links to their social outlets, and highlights their favorite furnishings and Look Book images from the site. Partner articles live beside Dering Hall's own exclusively created content celebrating its members, an exclusive group of high-end furnishing brands, artisans, design galleries, interior designers, and architects. Editorial content from partners is featured on Dering Hall's new redesigned homepage, new Daily Features landing page, and in emails. Dering Hall has also revamped its Home Furnishing section to improve category promotion and allow users to shop by brand, by design center, and by editorial partner picks, making it more efficient and enjoyable to navigate the $50 billion high-end home furnishings market. Dering Hall, http://www.DeringHall.com, is the place where interior designers, architects, and sophisticated consumers go to shop, get inspired, and market their professional services. The site features high-end home furnishings from the world’s most renowned brands, artisans, and design galleries. In addition, Dering Hall showcases the services and portfolios of the world's top interior designers, architects, and landscape architects. Dering Hall launches a new editorial platform enhancing high-end home furnishing shopping. Forty leading interior design publications partner to establish the online hub for design news and trends.